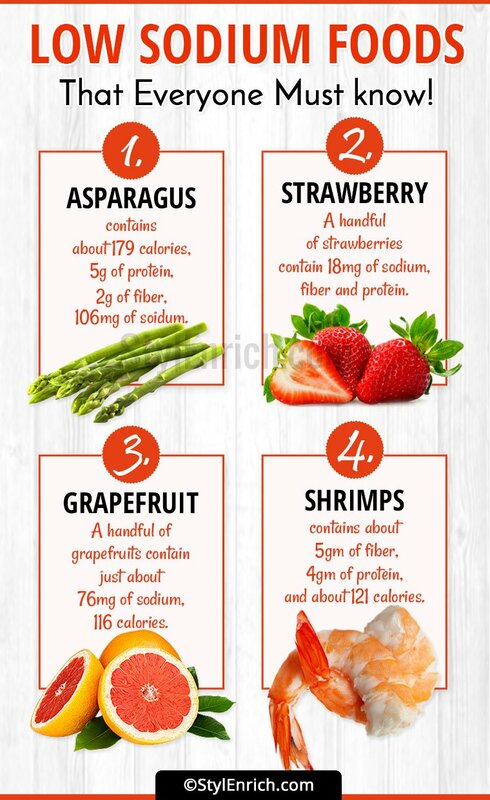 List of Low Sodium Foods for Healthy Heart, Blood Pressure & Kidneys! Today, we present to you some interesting facts about sodium and the list of low sodium foods that must be included in your regular diet. So, you can lead to the fit and healthy life. Interesting Facts About Sodium You Did Not Know About! Sodium and its compounds are used for food preservation. Critical for blood pressure regulation and appropriate functioning of the nervous system. Sodium in isolated form alone is explosive in nature. Only when combined with chlorine, it becomes table salt. 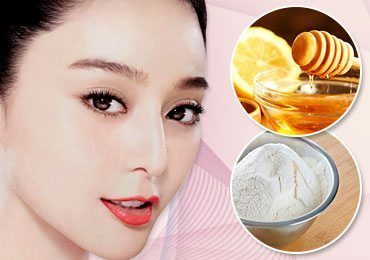 Sodium compounds are used in detergents and cosmetics. Sodium carbonate and sodium bicarbonate were used to pack mummies by the ancient Egyptians. Sugar is not your only enemy. Too much salt in the form of sodium too can be dangerous to your body. Earlier research had indicated that too much salt can affect the nervous system and increase blood pressure. You may be wondering that humans have used salt only as a food seasoning and as a method of preservation. However, adequate sodium salt is also required for the appropriate functioning of the body. However, when the sodium levels in the body increase it affects the nervous system, cardiovascular function, renal function, and increases blood pressure. Hence, it is very important to ensure an appropriate balance of sodium in the body. Since sodium is already present in adequate amounts in our body, it is essential to regulate sodium intake by consuming low sodium foods that help maintain an appropriate balance. Sodium is a mineral in the body that carries an electric charge and is often referred to as an “electrolyte”. The body balances the sodium levels in the body through various biological processes. Sodium is transported through water in the body. If the concentration of sodium in the tissue increases, the fluid in the body also increases. Hence, the sodium content is responsible for controlling the fluid concentration in the body. 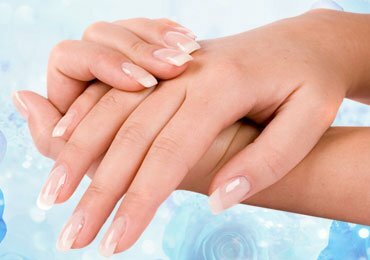 This mechanism ensures that the tissues and cells do not shrink or swell. Sodium plays an important role in the following functions of the body. Since sodium ions carry a positive electric charge, they easily dissolve in fluids like water. 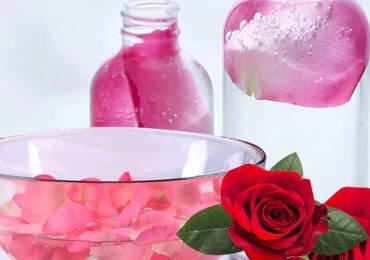 Since water transports sodium in the body, there is a direct influence of sodium concentration on the fluid distribution. Sodium concentration plays an important role in the distribution of fluids in the body. The concentration of sodium also helps the distribution of fluids in blood vessels and plays a major role in controlling blood pressure. Adequate amounts of sodium in the body keeps blood pressure in check. A higher sodium intake can cause more water retention in the blood vessels thus raising blood pressure. Sodium also acts as the carrier and transports minerals out of and into cells. The concentration of sodium is higher outside than inside, hence sodium flows into the cells. The flow is enabled when protein channels on the surface of the cell open up to facilitate sodium transfer into the cells. This force brings along all the minerals along with sodium into the cell. The inflow and outflow of potassium and sodium in the cells create a gradient. This electric activity is important for communication among the cells especially muscle and nerve cells. Nerve cells use these electric signals to send signals and muscle cells send the signals for contraction. The rhythmic beating of the heart is also coordinated by the flow of electrolytes. The average recommended sodium intake for an individual is around 2,000 to 2, 300mg of sodium per day. Those suffering from cardiovascular disorders and high blood pressure are advised 1,500 to 2,000mg per day. In fact, the American Heart Association recommends a limit of 1,500mg of sodium per day. Limiting sodium intake in food is essential for disease prevention. Including low sodium foods help regulate the sodium concentration in the body. Following are a list of foods low in sodium and must be incorporated in your daily diet. Welcome, a pleasant morning with a healthy twist that is a great option for low sodium foods. 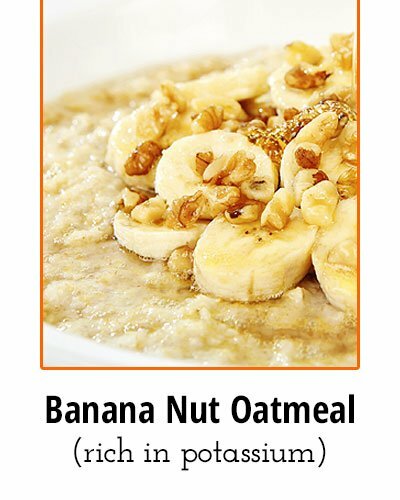 Oatmeal packed with cinnamon, nuts, and bananas is a healthy breakfast that has 0mg of sodium, no cholesterol, 9gm of fiber and 310 calories. Bananas are also rich in potassium that is known to decrease blood pressure. 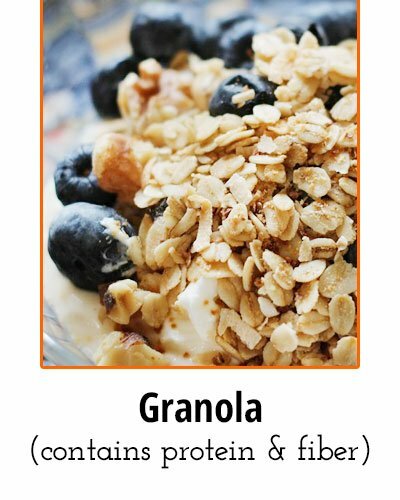 Granola is one of the cereals that top the low sodium foods list. These healthy cereals keep you full for longer periods of time and contain 22mg of sodium per 1 cup of serving. Each serving also contains 3g of protein and 3g of fiber. Give yourself a healthy start to the day with this nutty-filled breakfast that is super easy to make. 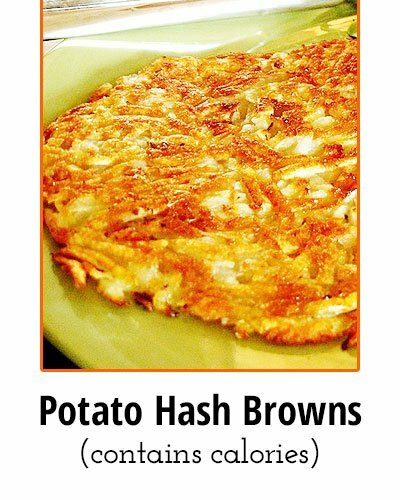 For all those who love potato hash browns, there is good news for you! Potatoes are low in sodium and the perfect vegetable that can be included in your daily diet. 1 potato consists of about 97mg of sodium, 97 calories and 1g of fat. One of the healthiest ways to consume potatoes is in the form of Crispy Potato Hash Brown that eliminates the traditional usage of oil for frying and uses high heat in an oven with cooking spray. This tangy and sweet salad is one of the best foods low in sodium. 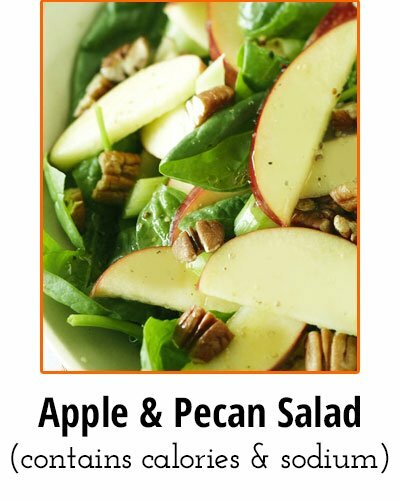 Pecan topping and apple with an oil based dressing provides heart-healthy fats and contain just about 300 calories per serving. This delicious salad contains a very low concentration of about 28mg of sodium per serving. This colorful salad is not just beautiful to look, but also a substitute for a healthy meal. 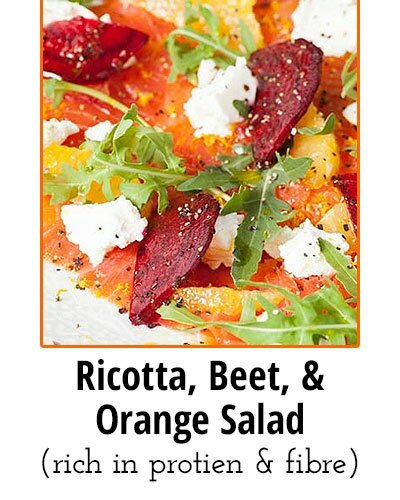 Ricotta, Beet, and Orange offer about 94g of protein, 3g of fiber, and 132 calories per serving. Salty and sweet, this healthy meal is very low in sodium containing just about 88mg per serving. Simply put these wonderful ingredients together to enjoy this delicious and healthy meal. 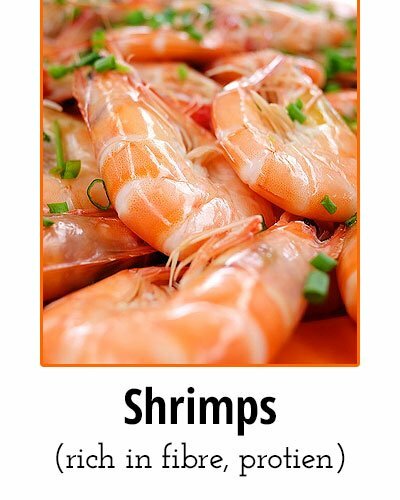 Shrimps top the low sodium foods list as they have a very little concentration of about 30mg per serving. Modify the traditional shrimps with citrus fruits, coriander leaves, and olive oil as the dressing. This snack will serve as the perfect appetizer before your meal. Each serving contains about 5gm of fiber, 4gm of protein, and about 121 calories. Noone loves the taste traditional tomatoes. But did you know that these wonderful veggies are very low in sodium content? 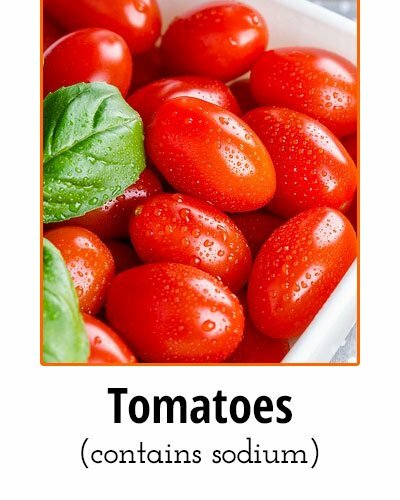 1 tomato contains just about 65mg of sodium. Turn your boring tomatoes into a delicious crunchy snack by baking them. You can use panko as bread to have along with baked tomatoes. You will get just the right kind of salt kick that you get when you eat fried food, but minus the sodium. Do like the chips and dip kind of snacks? You may be surprised to know that the traditional white beans and garlic can be easily turned into your favorite chips and dip snacks. Cook or bake white beans and for the dip use lemon juice and garlic. 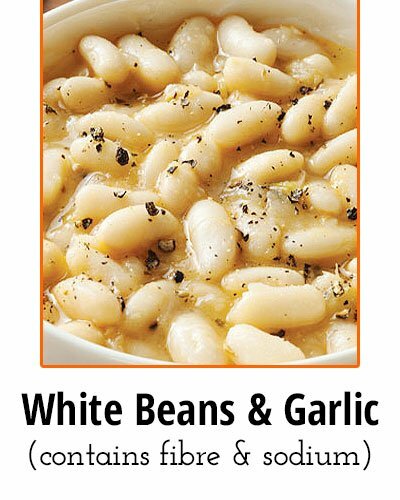 White beans and garlic are low sodium foods and each serving contains just about 94mg of sodium. This delicious snack is packed with 4g of fiber and 7g of protein. 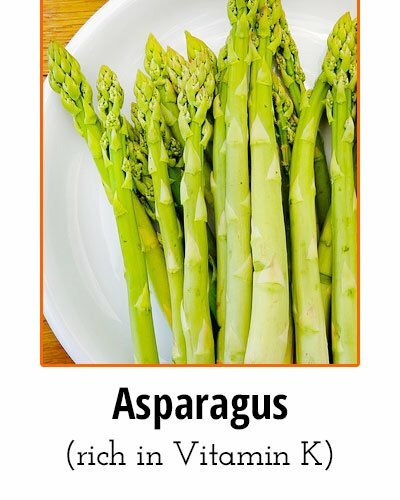 Asparagus is not just rich in Vitamin K but contains very little sodium too. Asparagus can be used as a topping on your favorite pasta. This filling dish will keep you full for a longer period of time. Each serving of asparagus contains about 179 calories, 5g of protein, 2g of fiber and about 106mg of sodium. This sweet and savory, cold and hot combination is the perfect low sodium foods that you can incorporate in your healthy diet. 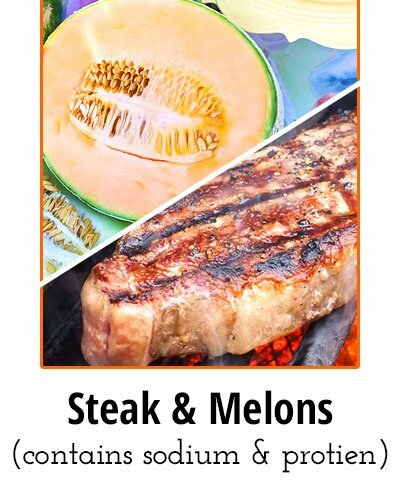 Bake or steam cook your favorite steak and have it along with melons. Each serving contains about 117mg of sodium, 15g of protein and about 181 calories. Little do we wonder that turkey can be categorized as a low sodium food. Yes, about 6 ounces of turkey meat contains just as low as 121mg of sodium. Turkey is also rich in protein containing about 51g and 280 calories per 6 ounces of meat. 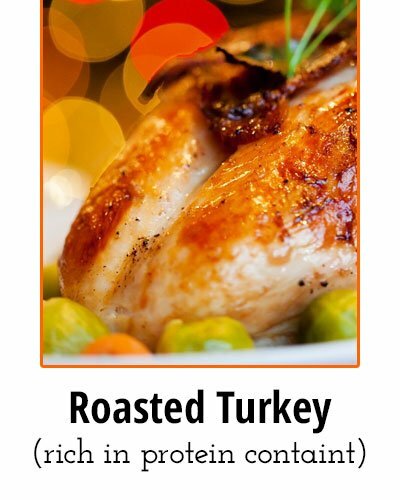 Roast your turkey and serve it along with fresh herbs to meet your nutritional requirements. Grapefruit is every person’s favorite and yes they are sodium friendly too. Bake grapefruit into cupcakes and have them as a mid-snack treat every time you feel hungry. These snacks are tasty, healthy, and very low in sodium. 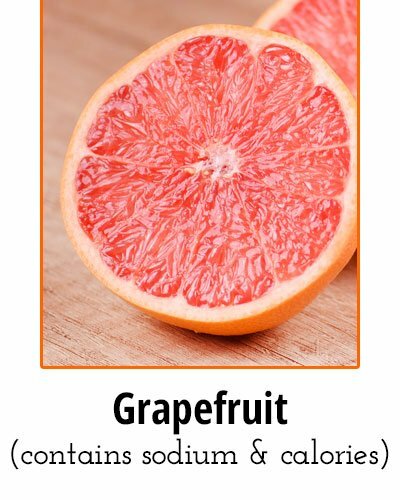 A handful of grapefruits contains just about 76mg of sodium and 116 calories. You can top up these yummy cupcakes with Greek yogurt to add in protein. 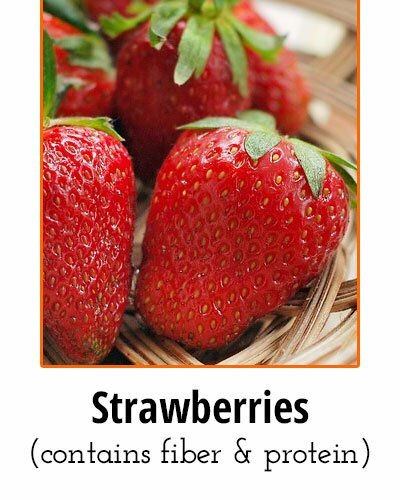 Strawberries are one of the wonder foods low in sodium. Turn strawberries into a delicious cocktail along with citrus fruits and enjoy them as a refreshing mid-meal drink. 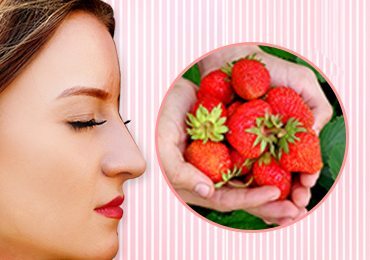 A handful of strawberries contain 18mg of sodium, fiber, and protein. Enjoy this low sodium fat-free drink every time you feel thirsty. This delicious summer drink is a perfect add in if you are on a low sodium diet. 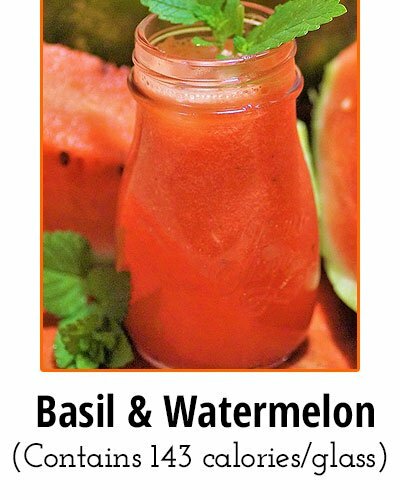 Mash watermelons along with basil water to have them along with your meal. Containing just about 143 calories per glass, this drink is perfect for those fitness freaks. 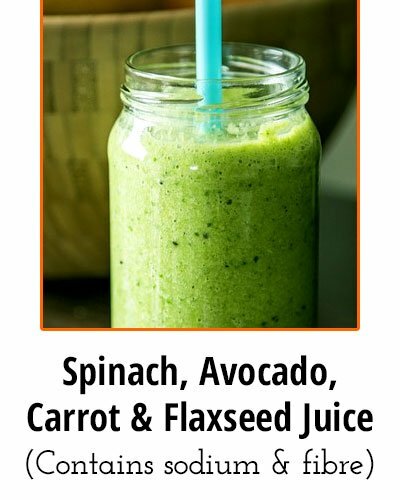 This wonder salad smoothie tops the low sodium foods list and is a wonderful drink to start your morning. One glass of this juice contains about 58mg of sodium, 10g of fiber, and 5mg of iron. Who Can Benefit From A Low Sodium Foods? Practically, everyone can benefit from a low sodium diet. The body requires only about a quarter of teaspoon sodium per day in order to function properly. Anything more than this can cause severe health consequences. People suffering from high blood pressure, kidney diseases, and cardiovascular disorders greatly benefit from a low sodium diet. Studies have shown that lowering sodium intake can reduce blood pressure, cure kidney diseases, and reduce the risk of developing cardiovascular disorders. Read nutrition labels on products you buy from grocery stores. These nutrition labels will give you a clear idea of how much salt is present in the particular food. Always choose natural and whole foods such as fresh fruits, veggies, cereals, and grains. Keep a food journal of the daily food you have consumed and how much salt you have added in each. This will help you stay within the recommended dosage of sodium. Avoid using salt substitutes without talking to an expert. These salt substitutes contain potassium and too much potassium can cause problems in the kidney and heart. Avoid eating too much food outside and resort to cooking and eating healthy at home. When you purchase canned foods, avoid the ones that have added sugar or any salt seasoning. Always rinse canned food to remove any salt residue before having them. Although most benefit from taking low sodium food, there is always a lower limit. Too low sodium can also have serious health implications. Those already suffering from low blood pressure, or kidney disorders need to consult their physicians for a recommended sodium intake before going on a low sodium diet. Also, those who are under medications such as corticosteroids that already shed sodium levels in the body, should not go on a low sodium diet as this would further dip the sodium levels in the body. Some sodium is essential to maintain healthy body functions. Hence, always remember to do everything under a certain limit. 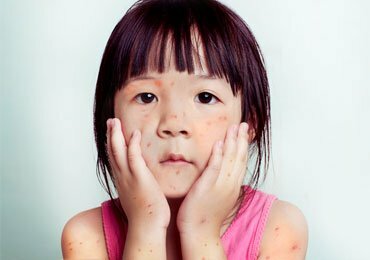 Too much or too less both may impose harm to your body. Keep in mind the recommended dosage of sodium and follow a diet according to that. Always consult a doctor if you have any doubts in mind. Read Next – Top potassium rich foods you must include in your diet! All About Nausea; Home Remedies, Tips and Much More! 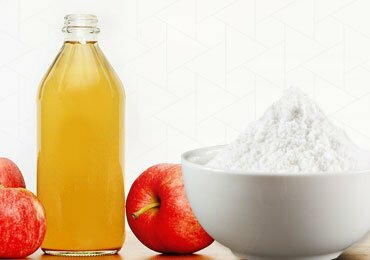 Apple Cider Vinegar and Baking Soda- A Magical Potion! 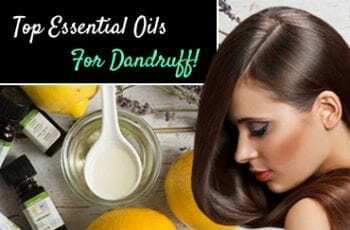 How To Take Care Of Hair In Rainy Season?